Welcome to our Apex Legends Sub Machine Guns List, here you can view the Best Sub Machine Guns Stats in Apex Legends. Another run and gun weapon type, however, this type does not pack as big of a punch as shotguns. We display the Apex Legends Sub Machine Guns using a Tier List format. 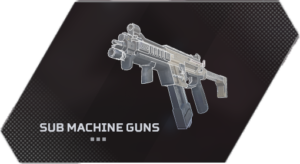 You can find the Apex Legends Best Sub Machine Guns in the S Tier, as you approach the bottom the become weaker ending with F Tier. Below we have a listed each of the Sub Machine Guns Stats for Body and Head Damage, along with the attachments that can be used with each one. -Stock 12 18 Rapid-fire automatic. -Stock 13 19 Twin barrel full-auto. -Hop-up 14 21 5-round burst.